The Audiobooks of One Dead, Two to Go and Two Heads Are Deader Than One are produced by Audible.com. The 5×8 trade paperback is distributed by Epicenter Press/Aftershocks Media. Wholesale customers, contact orders@epicenterpress.com. “Chava, the mother, is a hoot and Franklin is about as loyal and intelligent as a big dog can be. Chance, the now maybe lover, is attractive and the mystery is indeed mysterious pretty much up until the end. There are enough quirks in the characters and twists in the development of the story to keep things satisfyingly interesting all the way through. Elena Hartwell has conjured up a plausible protagonist and done a good job of plunking her into a setting and plot that nicely suit her.” Read more…. 5 Stars: “The characters are likeable and believable and Chava, Eddie’s card-dealing mom, is especially charming. It’s impossible not to root for them all through the story. Author Elena Hartwell showcases a delightful heroine in a story that promises pleasant romance and a hint of danger with a twist of an ending. This will keep one from ever putting this book down!” Read more…. “An engaging mystery that will keep you stumped to the very end. This novel had many twists and turns so that I was kept guessing all the way to the surprise ending. The characters are quite impressive and I enjoyed getting to know them. I could relate to Eddie and loved her quirky mother, Chava. However, Dakota’s character brought back unpleasant memories of high school and she made a great antagonist …. Although this novel is part of a series, it is a good standalone. For those who are fans of whodunits, this is a great read.” Read more…. 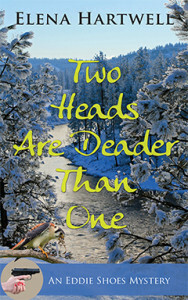 “Two Heads are Deader Than One is the second title in author Elena Hartwell’s Eddie Shoes Mystery’ series and continues to demonstrate her genuine flair for writing carefully crafted, impressively entertaining, and original mysteries.” Read more…. “A great mystery from the get-go, packed full of interesting characters. Eddie and her mom make a great team and for once the first person narrative, usually a turn off for me, kept the story moving on a steady burn. What was most remarkable for me though was the interesting presentation of mental health issues. The author’s writing style gave me a modern Mikey Spillane vibe and was quite enjoyable from beginning to end.” Read more…. 4 Stars: “The stories move quickly, there’s always danger, moments that make you laugh, and you worry about Eddie. She’s a good PI but she’s not real careful about her own safety. The author has her sticking her nose out a little further than necessary but it sure makes for a fun read.” Read more…. “Eddie Shoes is back in another page turner. Haven’t read book one yet? No problem. New readers to the series should be able to jump right into the story. Hartwell provides enough detail to get them up to speed without slowing down those who have read book one [….] Eddie’s witty no-nonsense personality and Hartwell’s well-paced writing style make the chapters fly by.” Read more…. “The author does and great job of weaving details and people together making a whodunit that mystery lovers will want to read!” Read more…. “Boasting a wonderful cast of characters that included Eddie and her delightfully charming mother, this was a great read and I can’t wait to read the next book in this terrific series.” Read more…. “In addition to convincing voices and accents for other characters, such as Shoes’s Latino father and an Indian landlord, Driscoll dons a gravelly tone for Shoes’s Jewish mother. Chava’s straight-shooting comments add humor and moments of tenderness to an enticing story that puts a unique spin on a classic detective genre.” Read more…. Elena Hartwell’s writing career began in the theater, where she also worked as a director, designer, producer, and educator. Productions of her scripts have been performed around the U.S. and abroad, with some of her plays available through Indie Theater Now and New York Theatre Experience, Inc. She lives in North Bend, Washington, with her husband. For more information, visit Elena’s website or her blog. Tuesday morning found Franklin and me driving back to my office. I came in every day, regardless of whether or not I had active cases. Checking mail and phone messages was important, of course, but I also liked having a routine, somewhere to go. My office was my safe haven now that Chava had moved in. Pulling into the lot in back, I noticed a car I didn’t recognize in the spot where I usually parked my Subaru—against the building, closest to the door. Ordinarily the lot was empty this early in the morning, but maybe Dakota had borrowed a car and was waiting for me. I parked in the row facing the side street. Despite my private, internal assurances I didn’t care one way or another whether Dakota skipped out, I’d felt let down yesterday when she didn’t show, so I hoped it was her. Had someone asked a few days ago if it mattered if I ever saw her again, “no” would have been my answer. But, now that she had resurfaced, I wanted her to be the best friend I’d loved, not the best friend I’d come to resent. This time I locked the back door behind me, hoping Dakota was already here. Franklin ambled ahead of me down the hall but came to an abrupt halt outside the office across from mine, lying down to face the door. My office building was essentially a duplex. From where we were standing, my office was on the right and the other office was on the left, with the hall down the middle. “What’s up, buddy?” I asked him. He was such an attentive listener I sometimes expected answers in English. He looked at me, making no sound—English or otherwise—before putting his attention back on the door. His body was on high alert, tail flat to the floor. “Someone in there?” I asked, apparently still expecting an answer. He uttered a short, sharp bark, proving my expectations weren’t unreasonable, except for the English part. Was Dakota parked out back and in there now? I pulled out my cellphone and called her number, but the call went straight to voicemail. I leaned against the door and listened. Nothing but a buzzing sound. And I got the faint whiff of a smell like someone forgot to take the garbage out. No one responded to my knock. Putting my hand on the doorknob, I discovered it was unlocked. I could just poke my head in. But what if it wasn’t Dakota, and I walked in on some guy getting his “cards read” by one of the resident hookers? That was something I did not want to see. Before anything else, I decided to park Franklin in my office. For whatever reason, my dog had not taken to Dakota and vice versa. I also didn’t bring Franklin into a business unless animals were allowed. I could usually count on him to settle right down with his chew toy, but not today. Once we stepped into my office, he danced around in front of me, as if to block me from getting back out the door. Considering his size, he did a pretty good job. The task of getting past him was arduous. I got halfway out the door and so did he, pushing his way into the hall. It took all my upper body strength to shove him back inside. I managed to get the door closed, but heard him woofing. That was one unhappy dog. Opening the door to the office across the hall, I was smacked in the face by two things: the stench, which was much worse than I’d thought, and the heat. The stench was so strong, it coated my throat. The heat was so high, I started to sweat. The room smelled like a cross between rotten meat and bodily fluids. What I wanted to know was whose. My heart started to pound. I’d put on gloves that morning with the colder temps, and it crossed my mind to leave them on. I felt around on the wall for the switch, flooding the room with light. The office had been broken up into smaller rooms with temporary walls; they were composed of flimsy metal frames covered in padded fabric for soundproofing. Sweat trickled down between my shoulder blades, but I wasn’t taking my coat off now. If some awful crime had taken place here, I didn’t want to shed DNA in the form of hair or skin cells. I could get in enough trouble just walking through the door. I stepped farther into the room and looked around, coming face to face with a corpse. My heart leapt a bit when I realized it wasn’t Dakota. Then the reality set in. It was still a life cut short. The man was dead. No doubt about it. Deader than a doornail—an expression I’ve never really understood, because a doornail isn’t alive to begin with. But dead he was, nonetheless. And, considering the smell and his skin tone, probably for a few days. I wasn’t squeamish by nature, but I could have gone my entire life without seeing a corpse covered in blowflies. It was one thing to be aware we all return to this earth, another to see the evidence up close. The hole in his forehead, which seemed to point to how he ended up in his current state of deadness, would most likely turn out to be a gunshot wound, not a third eye. But I’d leave it to the medical examiner to poke around in his skull and verify the breach had been made by a bullet, rather than just an explosive chakra. A quick look around eliminated suicide, in my opinion. There was no gun in sight and the wound was free of stippling or marks of contact from a weapon. People don’t shoot themselves between the eyes. Even if they have arms that are long enough, it’s just too awkward.